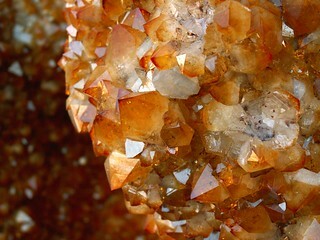 My favorite macro shot of the crystals in a large vug at the Tucson Rock and Gem Show. The preceeding images show other macros and a full frame view of this massive vug. Thanks to Oldha Media for cluing me in on the ID as citrine. Doh, I should have remembered this!